CV writing is an important first step to making a successful career transition within a college faculty. If the time has come for you to transition from your current role as a college instructor to move into a college dean position, you have options to showcase your experience when writing your CV. What curriculum vitae or resume format will you be using? A functional or chronological format? The chronological CV and the functional CV are both excellent ways for you to display your abilities in your application materials. Though the chronological style is quite traditional, a functional resume can be a great tool for professional higher education instructors hoping to showcase the skills they have gained over a short period, or through unique experiences that don’t easily mesh with the chronological format. A functional CV uses the skills and abilities you’ve developed as an instructor to tell your story and make the best case for your candidacy. Relevant education accomplishments and details are usually grouped together under a particular heading related to the content which indicates the field of expertise. If your story as an educator doesn’t follow a linear path, a functional resume is an excellent way to group your experiences to present them to a hiring committee. Take the time to read the top professional resume tips for higher education to create the perfect job search document. If your story follows a more linear path, a chronological CV will be your best bet. If you have moved from point A to point B to point C in both time and career development, this is a great tool to showcase your professional development over time. A chronological CV/resume is often a highly practical choice for candidates hoping to move from an instructor position to a role as a dean since this CV format allows you to showcase a list of accomplishments, educational attainment, and work history for the benefit of your potential employer. There are a lot of higher education job search tips available to implement. Submitting the perfect CV and a cover letter focused on higher education is vital to your job hunt success. It’s important to begin your CV with a stellar CV or resume summary or profile, as it will allow you to give potential employers a clear snapshot. Effective CV writing will require you to write a CV profile that is targeted correctly. This profile or summary will show ways in which your knowledge and expertise can effectively benefit your department, division, or college’s students, faculty, and support staff if you become a dean. Your career objective can also help you to explain why you are the best candidate for the position of the college dean. Your CV profile or summary is your first impression within your CV curriculum vitae for a higher education position. This objective pulls the double duty of helping employers understand who you are and why you are the best educator for the higher education role. Communicate that you are familiar with the needs of your faculty, an experienced practitioner who can help programs and processes develop and grow. Show you are a capable administrator who can navigate the stormy waters of the higher levels of academia. As a college instructor looking to become a dean, it’s crucial that you display familiarity with a range of competencies. 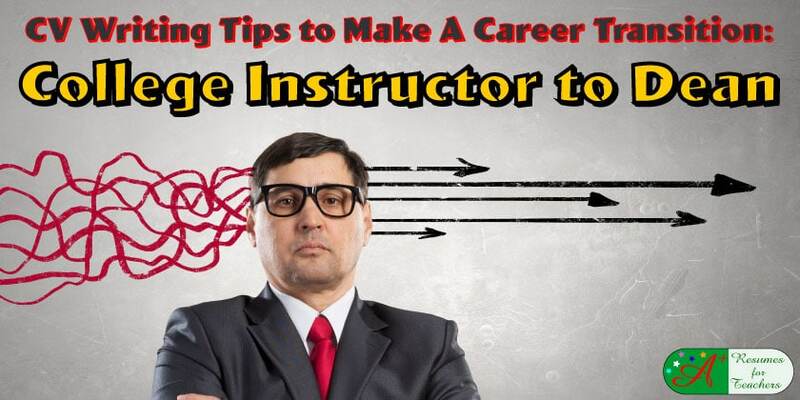 Start with the instructor focused curriculum vitae you wrote to apply for the current role you hold. From your current CV curriculum vitae, you need to tailor it to communicate the skills, accomplishments, and value you can bring to the position of Dean. An excellent Dean has a solid understanding of the students they serve. When CV writing, you’ll want to demonstrate your awareness of the diverse range of academic backgrounds your students possess, as well as the cultural and socio-economic conditions that are present in the population at your institution. As a college dean, you’ll need to possess an exceptional proficiency to introduce and propagate relevant academic policies within the education system. You’ll need to be able to use your understanding of students and their needs to craft institutional policies with the help of the main campus stakeholders. Know what policies are already present on your campus and how they affect both faculty and students. To develop and implement the kind of policies that will have a positive effect on your campus, you’ll need to demonstrate your ability to work hand in hand with departmental administrators, faculty members, students, including student leaders and representatives on the central decision-makers, and other offices at your institution. These partners might include other deans, the registrar’s office, student affairs, financial services, or other key stakeholders across campus. There are individuals and groups you can partner with to be successful, and you want to showcase your ability to forge relationships that will serve your students. When you become a dean, you’ll be called on to make decisions that affect teaching and learning. Your CV/resume should effectively demonstrate your ability to respond to concerns, think critically about issues, and find resolutions to complex, thorny issues. If you can do that while also navigating the web of campus partners and resources, that makes you a strong candidate for the dean’s suite. Your goal as a college instructor is to highlight your capability to develop knowledge and complete tasks like these. Use your existing experience to show how the next natural step in your journey as an educator is to move into higher administration and become a dean. Work experience and educational attainment are other places to highlight your qualifications when writing your curriculum vitae (CV). Your professional experience is where you provide the documentation you need to demonstrate that you have the knowledge and skills to be successful. The description of your work experience will play a significant role in the assessment of your eligibility based on the qualifications you have provided. You’ll want to make sure your description of your experiences are in line with the requirements being sought by the college or university from which you are applying for Dean’s position. Well written, highly organized CV writing is your first step towards making the jump from an instructor to a dean. This first step is where you make your case using reliable facts and supplemental documents. Your resume is an employer’s first look at your skills and qualifications, and you’ll want to be sure to make an honest, compelling, well-constructed first impression. The information you present needs to be supported by facts and supplemental documents. Your resume only serves as a representation of your actual skills and qualifications which will be assessed once you submit the needed documentation. Bear in mind that you need to make your resume compelling enough so you can attract the attention of a potential employer from the university or college where you are planning to transition from a college instructor to secure the position of Dean. Your College CV is your introduction to a potential institution, so the way you present your information in your CV can make all the difference to your chances of securing an interview. After you land a job offer, there are ways to achieve a salary increase in higher education. To learn more about how we can help you with your CV writing by crafting a curriculum vitae designed to showcase your experiences, education, and abilities, check out our resume packages.